태양열을 이용해 충전지(불포함)에 전기를 충전했다가 밤에 불을 밝히는 조명용 키트입니다. An automatic guided light circuit, to be installed at places where light is required before getting dark. - Consumption : 2.5mA. (standby in sensor mode), 80mA. (working in sensor mode), 100mA. (ON mode). 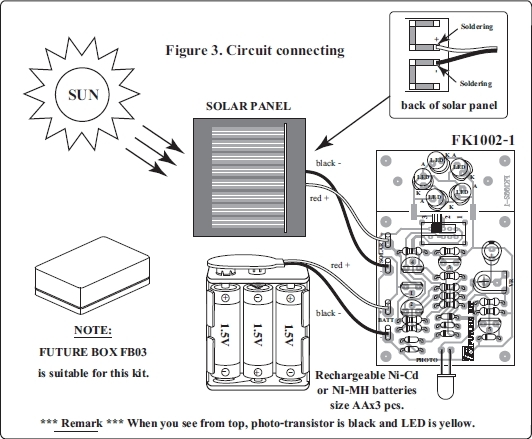 - Built-in recharging circuit from solar panel. 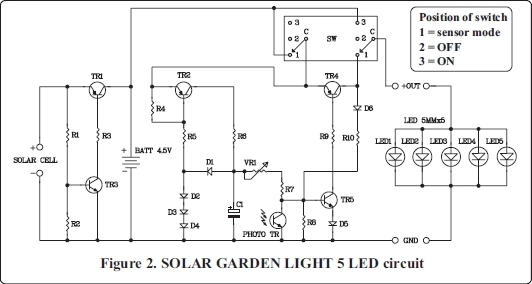 - Power of solar panel : 4VDC. 60mA. - Can select mode by slide switch. - Adjust sensitivity with potentiometer. - PCB dimensions : 67 x 43 mm.